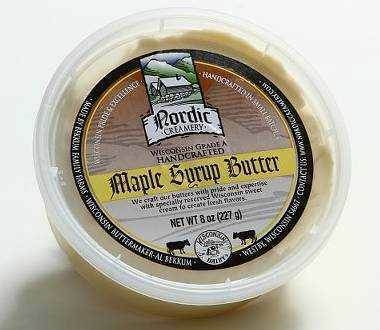 Maple Syrup Butter starts with really high quality Nordic Creamery butter, then we infuse it with real Wisconsin maple syrup. This butter balances the sweet and creamy aspects well and is enjoyed by both kids and grownups. Use our creamy maple syrup butter on bread, bagels, pancakes, muffins, toast, biscuits or anything you would normally spread jam or pour syrup. Service Area: Westby, La Crosse, Sparta, Holmen, La Crescent, Green Bay, Chippewa Falls, Rhinelander, Waukesha, Wisconsin Rapids, Eau Claire and surrounding communities.